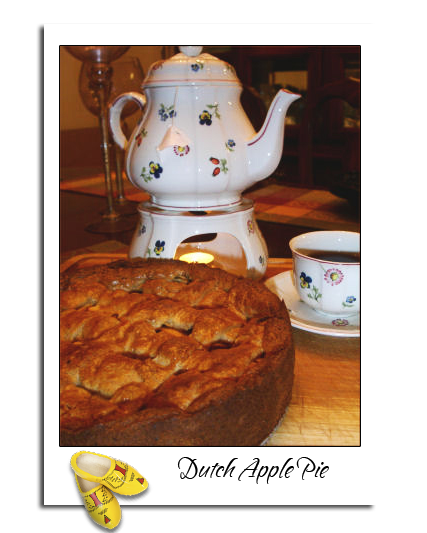 Recipes for Dutch apple pie go back centuries. There exists a painting from the Dutch Golden Age, dated 1626, featuring such a pie. 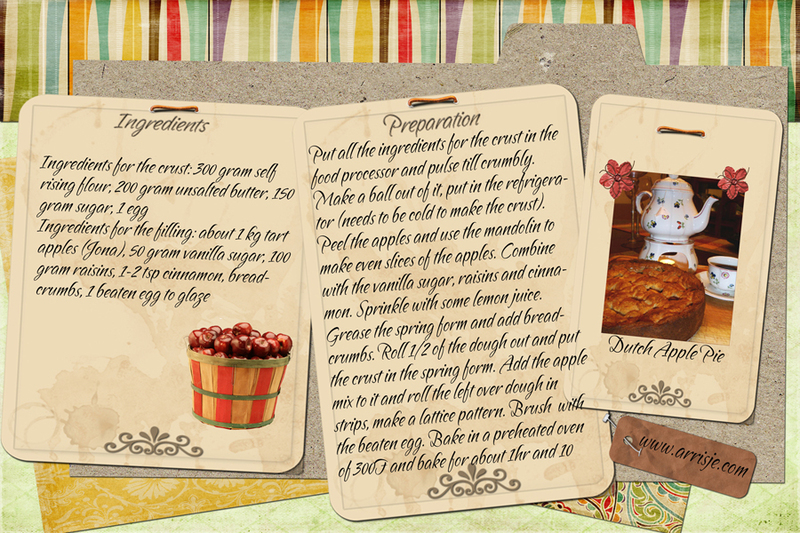 The basis of Dutch apple pie is a crust on the bottom and around the edges. This is then filled with pieces or slices of apple, usually a crisp and mildly tart variety such as Goudreinet or Elstar. Cinnamon and sugar are generally mixed in with the apple filling, and lemon juice is often added. The filling can be sprinkled with liqueur for taste. Atop the filling, strands of dough cover the pie in a lattice, holding the filling in place but keeping it visible. Though it can be eaten cold, most people crave for the warm version, with a dash of whipped cream or vanilla ice cream. 1. 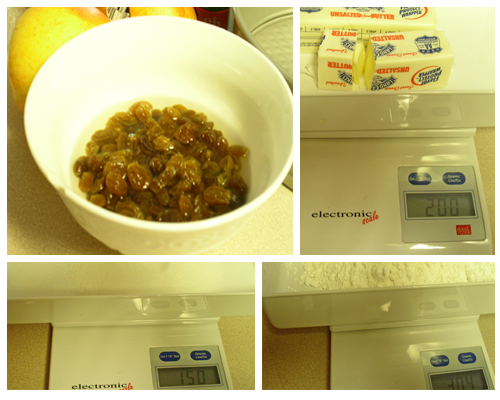 Well the raisins in water or rum Put all the ingredients for the crust in the kitchen aid machine, and mix till the dough is a ball. Take the dough out and put in the refrigerator (needs to be cold to make the crust). 2. Peel the apples and use the mandolin to make even slices of the apples. Combine with the vanilla sugar, raisins and cinnamon. Sprinkle with some lemon juice, that way the apples won’t turn brown. Add the cinnamon ( I forgot the pic of that one but you get the idea). 3. Circle with a pencil around the spring form on parchment paper, cut the circle out. Grease the spring form add the cut out parchment paper and add the breadcrumbs, that will absorb the moisture. 4.Roll 1/2 the dough out and put the crust in the spring form, don’t make it too thick. 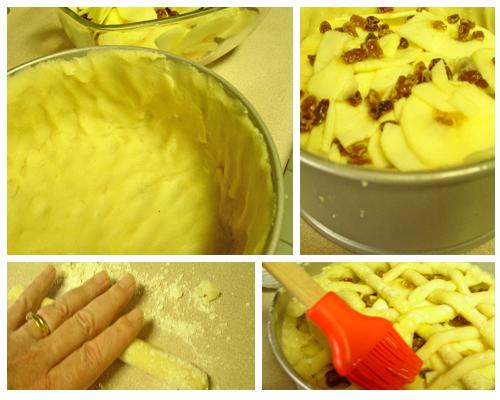 Add the apple mixture to it and roll the left over dough in strips and make a lattice pattern. 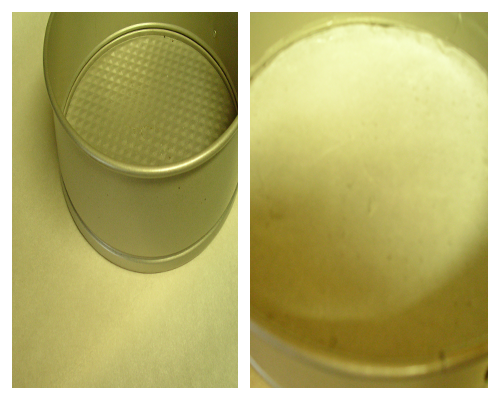 Brush the lattice with the beaten egg. Bake in a preheated oven of 300F and bake for about 1hr and 10 min. According to mom’s recipe it should be 175C which is 340F. If you have bigger slices of apple you need to cook it longer. Well the raisins in water or rum Put all the ingredients for the crust in the kitchen aid machine, and mix till the dough is a ball. Take the dough out and put in the refrigerator (needs to be cold to make the crust). 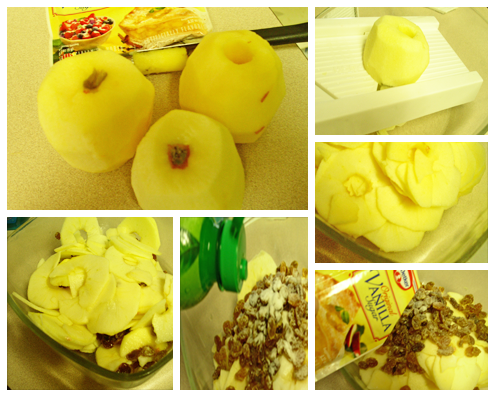 Peel the apples and use the mandolin to make even slices of the apples. Combine with the vanilla sugar, raisins and cinnamon. Sprinkle with some lemon juice, that way the apples won't turn brown. Add the cinnamon ( I forgot the pic of that one but you get the idea). Circle with a pencil around the springform on parchment paper, cut the circle out. Grease the spring form add the cut out parchment paper and add the breadcrumbs, that will absorb the moisture. Roll ½ the dough out and put the crust in the spring form, don't make it too thick. Add the apple mixture to it and roll the left over dough in strips and make a lattice pattern. Brush the lattice with the beaten egg. Bake in a preheated oven of 300F and bake for about 1hr and 10 min. According to mom's recipe it should be 175C which is 340F. If you have bigger slices of apple you need to cook it longer.